Whoever shall faithfully serve me by the praying of the Rosary shall receive signal graces. I promise my special protection and the greatest graces to all those who shall pray the Rosary. The Rosary will cause virtue and good works to flourish; it will obtain for souls the abundant mercy of God; it will withdraw the hearts of men from the love of the world and its vanities, and will lift them to the desire for Eternal things. The soul which recommends itself to me by the praying of the Rosary shall not perish. 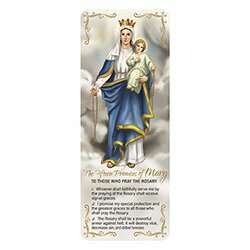 Whoever shall pray the Rosary devoutly, applying themselves to the consideration of its Sacred Mysteries, shall never be conquered by misfortune. God will not chastise them in His justice, they shall not perish by an unprovided death; if they be just they shall remain in the grace of God and become worthy of Eternal Life. Those who are faithful to pray the Rosary shall have during their life and at their death the light of God and the plentitude of His graces; at the moment of death they shall participate in the merits of the Saints in Paradise. You shall obtain all you ask of me by the praying of the Rosary. All who pray the Rosary are my sons and daughters, and brothers and sisters of my only Son Jesus Christ. 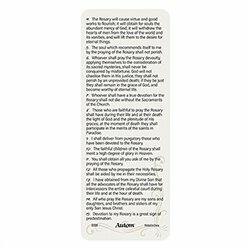 Includes a laminated body for extended use in your Bible or prayer book. Perfectly priced for ministry events and also makes a great gift for Feast Days!